Chorizo and cornbread stuffed pork chop with skillet corn and hominy grits. Photo by Dan Morgan. 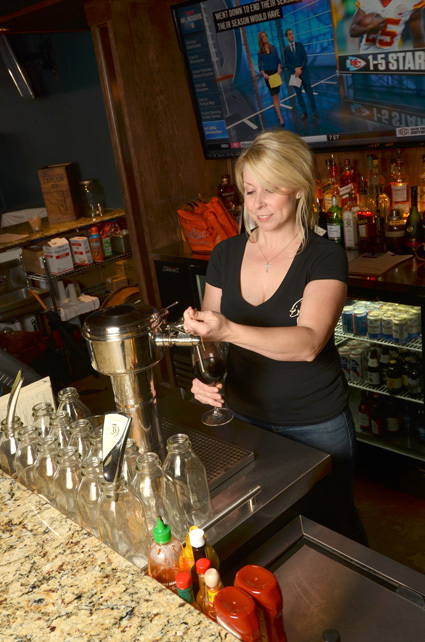 If you should happen to stroll down Broken Arrow’s thriving and delightfully renovated Main Street toward sundown, you might see two tough-looking men seated outside an attractive new cafe. One’s an amiable mountain of muscle and the other is lanky and tattooed. They chat; each completes the other’s sentences. They’ve obviously known each other a long time. They’re happy, they’re excited and it’s contagious. “Oh it shines!” “It pops, it pops so well!” “It really sings!” What could they be talking about? As it happens, they’re celebrating their new creation. Mustard seeds pickled in Guinness. It’s something you’ll barely notice, one component among many used in two of the flamboyant, elaborate yet deceptively simple dishes served in that cafe behind them. “It takes a lot of work to make mustard seed taste good,” says Doug Zimpel. His tattoos, it turns out, are all food-related, featuring pigs rampant among garnishes. He wears glasses and he thinks a lot. “They’re inherently bitter so you have to boil and strain them eight times. That softens, plumps and sweetens them.” Sounds like hard work. “I take his ideas and plug in my cooking experience,” agrees Doug, who has over a decade of experience under his belt. That started one amazing day when Doug, then a worker in a big IT firm with acres of cubicles like those depicted in the cartoon Dilbert, suddenly thought “I was not born for this,” stood up, walked out and got a job at the first restaurant that would hire him. His journey took him to OSU culinary school, an apprenticeship with one of the star chefs of Napa Valley, and later a job as executive chef at the highly regarded Boston Deli. 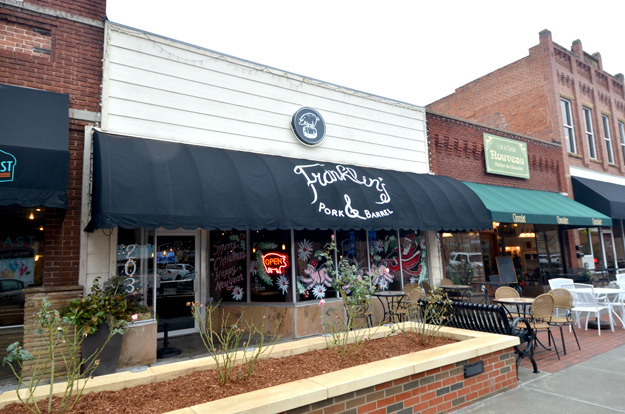 Franklin’s exterior store front located on Broken Arrow’s popular Main St.
Franklin’s Pork & Barrel offers four different wines on tap. The sun has set and it’s time for dinner. As you walk toward Franklin’s, you’ll notice a bright, spiffy dining room to the left. Exposed brick walls, white linen tablecloths, a rainbow of abstract artwork all make you wish that this dining room were open in the evenings. Alas it’s Franklin’s sister restaurant Toast, open for breakfast and lunch only. Ben’s excited about the food Chef Doug serves at Toast. “We have three kinds of eggs benedict,” he boasts. “One of them is accented by a caprese salad. I love the mouth feel you get when cold salad hits hot eggs.” Tonight, though, you’ll have to content yourself with Franklin’s stuffed and smoked pork chop. One bite and you’ll forget about the eggs. 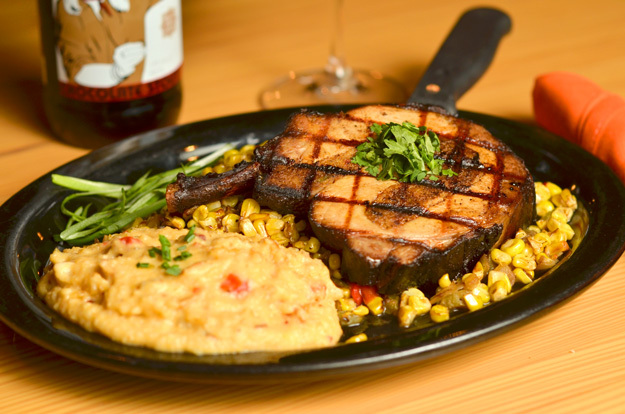 A rich smoky flavor permeates the pork chop’s juicy, tender meat, and it’s picked up by contrasting woodsmoke whiffs from the corn succotash, the grits and the chorizo and cornbread stuffing. (And what a bargain! The huge chop is $13.) Or you might try the chili and chicken. A huge half-chicken packs a big flavor punch, and it blends well with the rich, hearty chili that it sits atop. Under that is cornbread, which melts into gooey goodness. Then there’s the barbecue platter, which features some of the best ribs you’ll find within a hundred miles. The platter also has turkey, brisket, pulled pork, red coleslaw, all on a carving board shaped like Oklahoma. Or the burgers…. “those burgers are Heaven on earth, I swear to goodness!” calls out a diner from the bar. 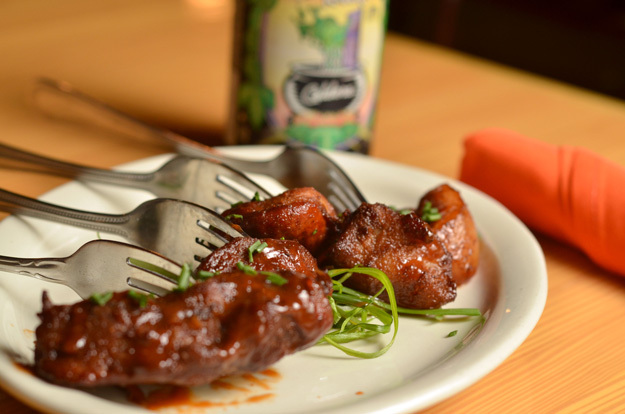 And so they are, packed with an ineffable smoky flavor yet rich and juicy. For a lighter meal, there’s the Scottish salmon. It’s served with a mole pipian, a hard-to-find and hard-to-make Mexican sauce that features pumpkins, poblano peppers, and so many other ingredients your eyes will glaze over as Doug recites them. There’s wine by the glass to wash all this down. They use a new and rather expensive machine that uses inert argon gas to make sure that the last glass from the bottle tastes as fresh as when the bottle was first opened. “I just like to eat a lot!” says Ben Buie. With food like this, who can disagree? 203 S. Main St., Broken Arrow.